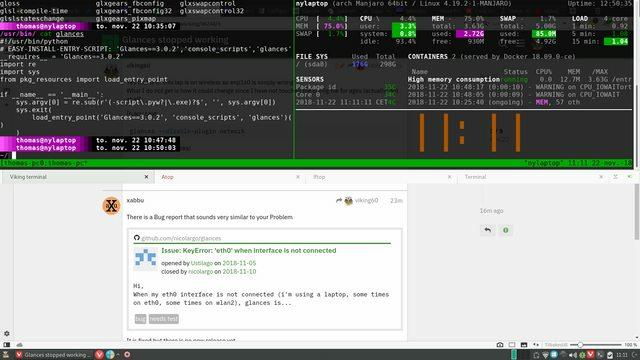 Glances is a replacement that works on Linux Mac and Windows. It Monitors your system or any system on your network and Manjaro Fedora Debian,Mint,Ubuntu ++ has it in the repos. Simply install it and type glances to monitor your system and press h - to get help and h again to get back. It can be used in tmux etc. Nice little tool this - enjoy!
. :[ [email protected] : 10:38:07 : ~ ]:. I like that it gives those warnings at the end on your computer. It's not doing it on the servers though, unless there's no warnings to notify of? It will warn equally well regardless of what box you are monitoring. I think it is easier to structure the info with glances. Like simply pressing m will sort by memory usage and c by CPU (a- for automatic is default). I have noticed that this is not in the Mageia or Mandriva family repos - but I guess it can be "borrowed" from Fedora. Today my Glances stopped working! I got a lot of jiberish text instead of the usual system info. It turns out that glances got my network interface wrong assuming that my Laptop was on wire (enp1s0) while it actually is wireless.. This starts Glances without the network plugin and everything ('cept network) works just fine again.